Children board the bus on the first day of school in Auburn. Gov. 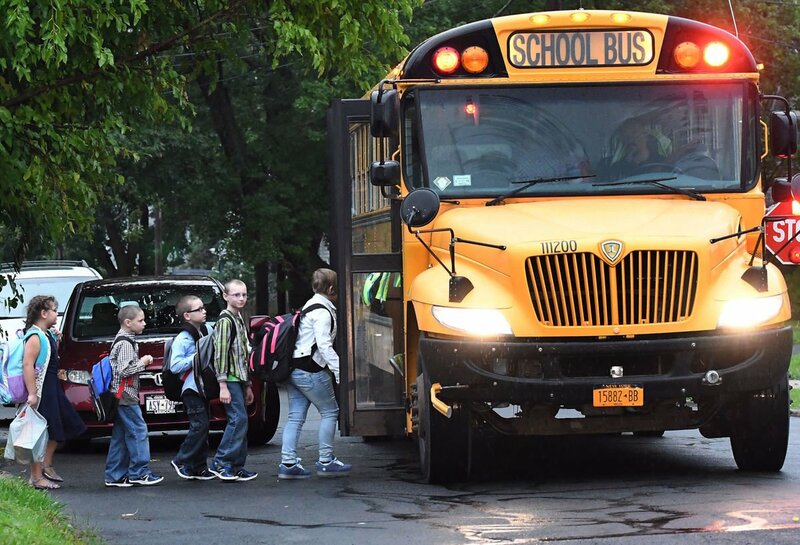 Andrew Cuomo will pursue stricter penalties for New York drivers who pass stopped school buses, according to his 376-page State of the State book released this week. It is illegal in New York to pass a school bus when it is stopped and its red lights are flashing. The law applies to vehicles approaching the rear and front of the bus. Motorists are required to stop for buses when its red lights are flashing, even when the bus is stopped on a multi-lane highway. Under current state law, the first conviction for passing a stopped school bus could result in a $250 to $400 fine and up to 30 days in jail. The possible penalties for a second conviction within a three-year period range include a $600 to $750 fine and up to 180 days in jail. For three or more convictions within a three-year period, the fine would range from $750 to $1,000. Offenders could also spend up to 180 days in jail. But Cuomo believes the penalties should be tougher, especially after a statewide enforcement last year found many motorists disobeyed the law and passed stopped school buses. The enforcement campaign, Operation Safe Stop, was held on April 27, 2017. The goal of the initiative was to raise awareness about the law prohibiting drivers from passing a stopped school bus when its red flashing lights are activated. According to a report released by the Governor's Traffic Safety Committee, 70 law enforcement agencies across the state participated in Operation Safe Stop. On the day of the campaign, 1,037 tickets were issued for passing stopped school buses. An additional 2,964 tickets were issued for other violations, the report said. "Extrapolated for 180 days of school, someone passed a stopped school bus 180,000 times a year, endangering the safety of school children," the governor's office wrote in the State of the State book. The book added that Cuomo will "increase the fine for passing a stopped school bus as a way to increase student safety." But specific details about his proposal weren't disclosed. A spokesperson for the governor said more information about the plan will be outlined in the executive budget, which will be released later this month. School buses are a primary mode of transportation for many students across the state. Roughly 2.3 million students in New York ride school buses every year, according to the governor's office.